Background: Atopic dermatitis is a common skin disease associated with chronic inflammation in the skin and itches and most patients have a positive family history of dermatitis. The major treatment of dermatitis, based on allopathic medicine, includes symptomatic treatment by oral antihistamines and topical or oral corticosteroids, which, in long-term, will cause various side effects. Iranian Traditional Medicine (ITM) have cited the treatment of various skin diseases like jarab that resembles the characteristics of dermatitis. The basics of Iranian Medical School, which include reduction of symptoms, treatment of disease-causing agents have also been considered, which leads to a longer period of disease-free period for the patients. Case Presentation: A 38-year-old female patient presented with more than 15 years of chronic dermatitis of the hands and feet with itchy areas on the skin (seen as dark spots). Various chemical treatments received by the patient had no acceptable satisfaction for the patient and symptoms relapsed after cessation of treatment. At admission to traditional medicine clinic, first, the patient was visited by a dermatologist, then complete history was taken, and after checking the disease symptoms, she received ITM on Setteh-e-Zarurieah, especially nutrition and treating the root cause of the disease. After two months of drug therapy, popular lesions were significantly reduced in this period and only occurred temporarily after hair removal. Itching was improved by >80% and dermatology life quality index (DLQI) declined from 10 to 1. Dark spots remained but became a little bit lighter which was satisfactory considering the long duration of the disease and the various chemical treatments received. After one year of follow up, there was no incidence of new lesions even without medication. Conclusion: Iranian traditional medicine focuses on treating the root cause of the disease using therapies with low side effects and considering nutrition and lifestyle modification in patients that can help with chronic skin diseases in reducing the symptoms and long disease-free period. According to the World Health organization's approach to increase usage of traditional medicines in treatment of diseases, further research is necessary in this area. Atopic dermatitis is a genetically chronic relapsing inflammatory pruritic skin disease that occurs mostly from childhood to adulthood . The prevalence rate has been reported to be 1-10% in adults and 20% in children . It still has no certain treatment. The major treatment of dermatitis in allopathic medicine include oral antihistamine and topical or oral corticosteroids that can cause side effects in long-term use, such as burning, itching, acne-like lesions, skin atrophy, hypopigmentation, allergic dermatitis, striae, skin corrosion, telangiectasia, skin sensitivity that impose high costs for patients [3-4]. In some cases, the disease cannot be controlled with these methods . In traditional medicine books, in the treatment of Oram and bosors, diseases like Jarab, Hekkeh, Ghooba, Saafe Yabese and Taqshofe Atraf have been described to resemble the characteristics of dermatitis. In ITM’s perspective, these diseases are caused by corruption of blood or acute mixture of temperament with blood and treatment plan is based on treating the root cause of the disease, including food avoidance, blood purification, pathogenic temperament relief, and soothing skin itching by local moisturizing and cooling the location of the lesion . A case report (2013) evaluated the effect of treatment with a combination of Korean medicine, acupuncture, herbal therapy and herbal wet bandage in three pregnant patients with severe atopic dermatitis and reported reduced symptoms with no alteration in their blood test and no side effects . In a cohort study (2015) on 9012 children under 12 years of age with dermatitis, corticosteroid need was assessed one year after Chinese Traditional Medicine, in comparison with allopathic medicine, which reported that in the group treated with traditional medicine, frequency and duration of steroid use was significantly reduced (42%), while it increased by 34% in allopathic medicine group . In a clinical trial (2011) on mild to moderate dermatitis, corticosteroid need in the group receiving traditional treatment was significantly lower than placebo. In the above-mentioned studies, no notable side effects were reported for traditional medicine drugs . Due to the problems in the treatment of dermatitis in allopathic medicine and the proposed methods in traditional medicine and complementary medicine, there is need to critically evaluate these methods. In the present case report, a patient with a history of atopic dermatitis is presented, whose disease improved after treatment with traditional medicine. A 38-year-old married woman, employee, residing in Tehran, with a height of 156 cm and weight of 65 kg (BMI = 26.7) with 15 years complaint of severe itching of the skin referred to Khark Traditional Medicine Dermatology Clinic in October 2015. First, she was visited and diagnosed by a dermatologist from the point of view modern medicine and by a traditional medicine specialist and was treated with traditional medicine. On examination, pruritic erythematous popular lesions were observed. According to patient’s claim, the lesions occurred more on the palms and feet and less in arms, forearms, legs, groins, and armpits and the papules shortly disappear after a while, but the pruritic location remains as a dark spot. After examination by a dermatologist, the diagnosis was confirmed as atopic dermatitis. The first occurrence of the disease was after a long swimming (over 8 h) in the sea. Anxiety, nylon clothes, and foods like eggplant, tomatoes, potatoes and peppers were the aggravating causes of the symptoms of dermatitis. Her skin was not dried in the past, but after the disease and medication, her skin became dried. History of itching skin diseases was positive in the patient's mother and sisters. The patient had a history of using topical corticosteroid ointments and moisturizing, ecophane and ketotifen tablets for the treatment of dermatitis. Her menstruation was irregular for the past 13 years, with a duration of 10 days, with spotting in the beginning and end of the period; also, she had ovarian cyst on the left ovary on ultrasound and fibrocystic lesion in the left breast, and used metformin twice daily for this reason. The patient also cited a history of kidney stones. Based on the dermatology life quality index (DLQI) that has been validated in Farsi , Quality of life index of the patient was 10 before treatment with traditional medicine. Dermatitis has moderate effect on quality of life (moderate effect = 6-10). The patient was a woman with brown skin, black hair, warm touch, with a weight of 55 until the age of 24 (BMI = 22.6). The innate nature of this patient based on humor symptoms appeared to be warm and dry. Nevertheless, after the age of 24, she suddenly gained 10 kg weight which remained constant. On examination, she had a dry skin with itchy red rashes without secretion on the body, especially on the hands. The patient's history showed disgust from hot air and history of hot catarrh and sneezing in the spring at childhood and currently has cold catarrh as postnasal discharge. She had no complaint of gastric signs and sleep disorders, but due to a history of kidney stones, she takes 5-6 glasses of water daily without being thirsty. She had no regular exercise program and had a little more than usual sweating in the head and lower back. The psychological symptoms demonstrated that the patient suffered from stress and anxiety and she tried to control her anger and her anxiety exacerbated at occurrence of symptoms. The patient had a history of using hot and spicy foods which was reduced after developing dermatitis, but she stated using too much thick foods and a lot of liquids. On examination, the patient's pulse length was shorter than normal with average height and moderate strength, and had liver surfeit symptoms. On examining the tongue, she had tongue pallor with longitudinal grooves at both sides of the midline and increased wetness. No pathologic finding was observed in lab data. In the first meeting, she was recommended to avoid thick, and irritant foods, and advised to the maintenance of good health, including timely sleep and little fluid intake. In the first meeting, the following medications were prescribed: Aftymony whey protein each morning at fasting, liver capsule (a combination of coriander seed, fumaria, lettuce seed, chicory seed, Jujube, Rhubarb root, cassia and thyme leaf) 2 in the morning at fasting and 2 late at night, sekanjabin bozori (a combination of sekanjabin, fennel, chicory seed, celery seed, tribulus terrestris, cumin, khyarin seed, chicory root bark, fennel root bark, capparis root bark) a tablespoon each morning and evening, borage pulp 2-3 g each morning and evening, anti-smudge ointment (a combination of mercury, bitter almonds, eucerin) for topical application , lavender syrup 3 tablespoons daily for two months and nasal sweet almond oil one drop spill in the nose every night for one month. The second visit of the patient was after two months of drug use. According to her claim, papular lesions have significantly reduced and more than 80-90% itching occurred temporarily only after hair removal. Spots remained in itching areas. On examinations, according to dermatologist, there was a significant improvement and white areas have appeared in dark skin spots and DLQI was 1 which is in the range of no impact of disease on quality of life (No effect = 0-1). Other symptoms, like postnasal mucus was less. Regarding psychological symptoms, anxiety was reduced and effect of external stressors was reduced. From traditional medicine’s point of view, there was improvement in pulse length and liver surfeit. The moisture of the tongue was also reduced. The patient had no other referral after this visit and was followed for about a year after the last visit by phone call, which showed that she had stopped her medications and partially avoided spicy food. In the meantime, no new skin lesions occurred, only the dark spots of previous itching locations, and the lighter parts after the traditional medications still remained. DLQI of the patient is currently 1. From allopathic medicine’s perspective, genetic, immunity, and environmental factors which cause atopic dermatitis and immune system disorders are strongly associated with the itching level . A variety of antihistamines and corticosteroids are involve in classical medicine that can relieve the symptoms of the disease . With reference to ITM, Jarab disease has similar symptoms with dermatitis. Jarab are defined in traditional medicine as occurrence of small red rashes with severe itching and burning. Based on the literature, these rashes can sometimes have discharge. Most sites of lesions include the hands, feet, fingers, abdomen, back, testis, and thigh corners and rashes occur all over the body in case of severe disease . According to traditional medicine, each disease has four causes, such as material, efficient, formal and final . Traditional medicine books, in the treatment of Oram and bosors, have stated that Jarab is caused by blood corruption due to abnormal mixture of temperaments, including yellow bile, black bile, and salty phlegm with blood and frequent using of a lot of hot spices, salty and sweet foods and that corrupts the blood. Lot of spices, and salty and sugar foods corrupt blood vessels and this corrupted blood moves in narrow arteries and the skin accept it due to its weakness . Antaky stated that Jarab is a disease that appears on the skin cover and its material is spicy and salty due to extended use of substances such as garlic and salted food and warm foods that make the blood thick, such as eggplant, and dates, and beef that efficient cause is low heat which will finally cause rashes with different qualities that are certainly pruritic and sometimes with discharge and in the worst case scenario, will cause corruption and destruction of skin tissue . Therefore, the cause of outside the body of Jarab is the consumption of abundant harmful food and drink described above, particularly substances that thickens the blood. The patient presented used thick and spicy foods and mixed eating which can cause dyspepsia and production of inappropriate humor in the body . There were signs of increasing moisture in the body including weight gain in recent years, numerous cysts in the ovary and kidney stones and dermatitis in terminal parts of the body, which indicate accumulation of temperaments (burned black bile and salty phlegm), because the form of black bile is heavy sediment that is deposited . Basic mizaj of the patient and young age increased warm and quality of dryness in her body . Factors like stress and anxiety and being single raised the strange temperature and reduced the instinctive heat in her body which is the main cause of the disease, but the effect of emotional aspects were more and faster than other factors . Other causes of Jarab in this individual, from traditional medicine’s point of view, include brain weakness and loss of catarrh matter which is the mother of all diseases . Therefore, prescribed treatment to prevent outside material caused by food recommendations and eliminating causes which raised the abnormal temperature include reducing anxiety and strengthening the brain, relieving catarrh and correcting liver temperament for correct humor production and excretion of explosive humors and topical treatment to reduce skin darkening. For instance, whey protein which is a beneficiary for all diseases of explosive yellow bile and black bile and due to dilution and elegance, can easily reach far areas of the body like skin, which are the first steps in treating the disease [6, 20, 21]. The new approach of the World Health Organization (WHO) on the use of experiences of different ethnic groups that have been classified as traditional medicine necessitates the use of treatment of various diseases to decrease the costs and risks of diagnostic and therapeutic procedures . WHO validated the clinical studies of traditional medicine of each country that has enough evidence in Phase III clinical trial on a large group of people to validate the efficacy of the drug and considered safety studies less necessary . Based on rational principles and WHO approval, due to the indigenousness of this treatment principle and long history of treating many patients and based on the available written evidence of the benefits and risks, more attention should be paid to these procedures of traditional medicine and they should be used more often. 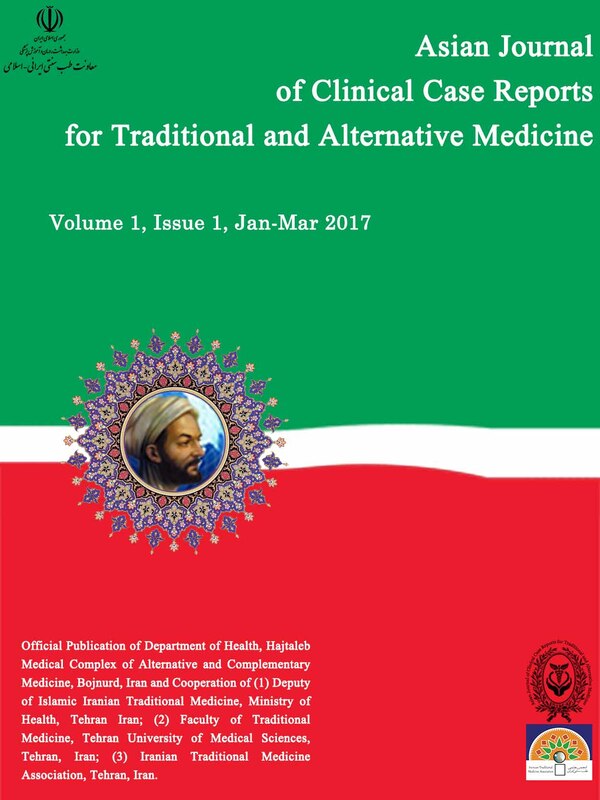 Conclusion: Iranian traditional medicine therapies with few side effects and paying attention to the correct nutrition, as one of the key bases of treatment, and taking the causes of disease into consideration, helped patients in reducing the symptoms of the chronic skin disease with a long disease-free period. The authors have no conflict of interest in publication of this article. Prof. Nafiseh Ismaili, dermatologist, visited and diagnosed patients based on allopathic medicine. Dr. Mehrdad Karimi, Assistant Professor of Traditional Medicine, was the main doctor of the patient and Dr. Fatemeh Eghbalian and Dr. Akramosadat Atyabi were responsible for taking patient's history and patient’s follow-up, data collection and drafting the article. The authors of this article sincerely thank the patient, who cooperated in providing detailed biography and completing the questionnaires. Chishti MA, Mohi-Ud-Din E, Usmanghani K, Nawaz A, Nazar H, Ahmad I. Comparative clinical efficacy and safety of coded herbal medicine Dermovix in the management of patients with atopic dermatitis versus allopathic medicine. Pakistan journal of pharmaceutical sciences 2015; 28(5): 1655-63. Schmitt J, Schakel K, Schmitt N, Meurer M. Systemic treatment of severe atopic eczema: a systematic review. Acta dermato-venereologica 2007; 87(2): 100-11. Chen HY, Lin YH, Wu JC, Hu S, Yang SH, Chen JL, et al. Use of traditional Chinese medicine reduces exposure to corticosteroid among atopic dermatitis children: a 1-year follow-up cohort study. J Ethnopharmacol. 2015 Jan 15; 159:189-96. Xiaohong Quan, Shenrong Cheng, Hong Ma, Hengxuan Huang, Bin Wang, Xiuhua Chen. Combination of flying needle with Chinese Herbal Medicine in the treatment of Atopic dermatitis: A clinical trial. Pak. J. Pharm. Sci., 2014; 27(5 (Suppl)), 1687-1690. Li S, Kuchta K, Tamaru N, Lin Y, Iwasaki S, Wang R, et al. Efficacy of a novel herbal multicomponent traditional Chinese medicine therapy approach in patients with atopic dermatitis. Complementary Medicine Research 2013; 20:189-96. Kim M, Yun Y, Kim K, Choi I. Three cases of atopic dermatitis in pregnant women successfully treated with Korean medicine. Complementary therapies in medicine 2013; 21(5):512-6. Hon KL, Leung TF, Ng PC, Lam MC, Kam WY, Wong KY, et al. Therapeutic effect and safety of a traditional Chinese medicine for atopic dermatitis in children: a randomised, double-blind, placebo-controlled study. Hong Kong medical journal Xianggang yi xue za zhi Hong Kong Academy of Medicine 2011; 17 (2):38-40. Aghaei S, Sodaifi M, Jafari P, Mazharinia N, Finlay AY. DLQI scores in vitiligo: reliability and validity of the Persian version. BMC dermatology 2004; 4(1):8-15. Nazem E. Tuba pharmacopeia. Tehran: Almoa; 2011. Yamashita H, Tanaka H, Inagaki N. Treatment of the chronic itch of atopic dermatitis using standard drugs and kampo medicines. Biological & pharmaceutical bulletin 2013; 36(8):1253-57. Avicenna. Translated by Abdolrahman Sharafkandi. The Canon of Medicine. 4th edition. Tehran: Soroush Publications; 1989. Arzani MA. Akbari medicine. Tehran: Institute for Medical History Studies, Islamic and Complementary Medicine; 2008. Davood A. Tazkere Olol-Alalbab Al-Jamea Ajaeb. Beirut: Alami Almatboat Institute; 2014. Majozi Ahwazi AA. Altebiyeh. Qom: Jalaluddin; 2008. Muhammad AS. Mofarrah Al-Gholub. Tehran: Almoa; 2012. Ali Khan W. Body Science. Luckhenow: Secretary Nolakshur; 1998. Jurjani IH, Alai Kh. Researcher/editor: Ali Akbar Velayati and Mahmoud Najm Abadi. Press Information; 1900. Gilani MK. Hefz AL-Sehaa Naseri. Tehran: Almoa; 2008. Najib al-Din S. Commentator: Kerman Nafis Ibn Avaz. Description of causes and signs. Qom: Jalaluddin; 2008. Aghili AS, Seyyedi MH. Great Qorabadyn. Tehran: Institute for Medical History Studies, Islamic and Complementary Medicine; 1276. Amin Gh. The most common traditional medicinal plants in Iran. Tehran: Tehran University of Medical Sciences, Research Services .Research Center for Medical Ethics and History; 2006. Amani O. Research Guideline for Evaluating the Safety and Efficacy of Herbal Medicines; Manila: World Health Organization, Regional Office for the Western Pacific; 1993.